When the friend who’s always ‘in need’ comes by your place unannounced, you need to make space for them to crash. While you might want to give them the boot, a futon or sofa bed will allow you to open your arms and re-live old memories. Futons sofa beds can be transformed from beds into sofas whenever you wish. And futons are no longer the shaky furniture that broke within months. With advances in craftsmanship, you get robust futons at reasonable prices. The uber-cool designs available in the market today combine the comfort of traditional futons with durable modern architecture. 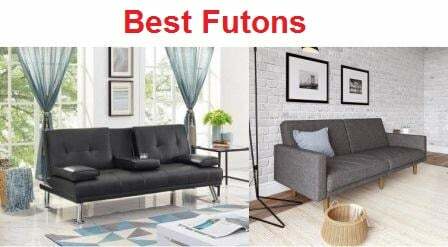 To get you ahead of the curve, we shortlisted the 10 most durable futon sofa beds (we have also written extensively about the most comfortable futon sofa beds) . They vary across price and versatile features. 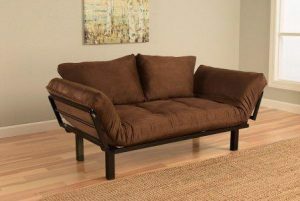 Why choose a durable futon sofa bed? Are futons bad for your back? Which are the most durable futon sofa beds? 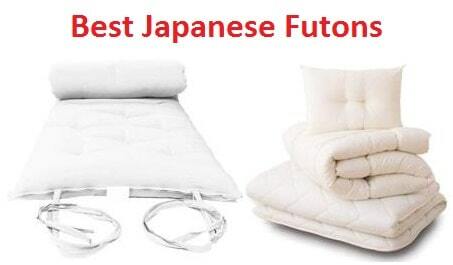 In traditional Japanese terms, a futon is simply a mattress that is slept on. It can be folded and stored away when not in use. It measures roughly 5-8 inches thick and doesn’t have any bedsprings. After westernization, foldable bed frames were added to futons making them a cross between a bed and a sofa. Now you can unfold your futon sofa bed and convert it into a hassle-free bed. Futons are generally offered without any springs because they tend to get damaged through folding and unfolding. Futon sofa beds are infamous as the ‘cheap’ form of furniture. Because of the convenience, they are thought of as a fix for multiple problems but not something you have in a well-furnished house. As if on a cue to dispel such fallacies, the market has seen an influx of durable futons sofa beds. From dorms to fancy interiors, futons are being accepted. Futons find uses in numerous situations. If you live alone in a single-room apartment, a futon sofa bed will be a lounging place by the morning and a bed by night. A single person can even put these together in no time. And a durable futon can take your daily sleep and sitting schedule without breaking a sweat. These are perfect for dorm situations as well. Durable futons can take the abuse that teenagers mete out to them. You can have it in your TV viewing area. Just in case you want to relax your back you can roll the bed out and have a ball. It’s a great addition to the video game den. Durable futons can take your feisty whoops and stand solid. And while having a gaming marathon, they will serve as a comfortable bed. They can be used in guest rooms, children’s rooms, den etc.. In case you have less space, we assume you would also want the best value for your money. So the ones we selected here are the most durable futons and sofa beds. You may also like our complete guide about the best Folding Beds. Frame material: The frame of the futon can be of wood, plastic, metal or particle board. 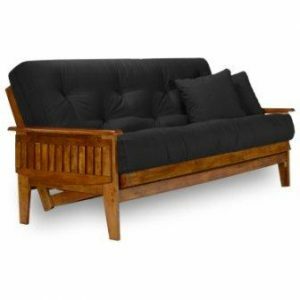 The most durable futon sofa beds are made of solid hardwood. These can take the repeated folding. The metal frames are usually reliable too. But you have to inspect the joints to see that the welded areas will hold. Particle Board and plastic are not very robust so we have avoided them in the most durable futon sofa beds list. Design: The way the bed is supported defines how long the futons will last. Many of the most durable futon sofa beds here have extended bases which jut out a little behind the backrest. When unfolded the whole mattress will rest on this base. This improves the life of the futon. Firmness: To balance the support required by sofa and bed, the most durable futon sofa beds have a fairly firm bed. They aren’t as plush as usual mattresses. Otherwise, there are pillow-top futons that have a soft layer of foam for those who can’t live without the fluff. Firmer futons are more durable, they don’t compress easily. Ask yourself how you intend to use the futon sofa bed? Will it be used for sleeping majorly or will you spend more time lounging/sitting on it? If the intent is to sleep on it try a sofa bed with a comfortable mattress. Its mattress should be thick enough for a good night’s sleep. If you are planning to sit more on it, look for something with solid back support. If you plan to fold and unfold it often, look for a futon with a robust folding mechanism. Ask where you want to set the futon? Does it have enough space for the unfolded version? Are there furniture items around that can be easily moved when you want to pull bed out? Futons are not mini-beds. They open up to full-sized beds when unfolded. They are even available in normal and queen sizes. Based on the number of people sharing the bed, you can pick the correct size. Extremes are always bad for health. Very soft beds and very hard beds are both bad for your back. The futons rest your back on a semi-firm surface. For your spine to lie straight through the night, the bed should be firm enough to support it but soft enough that it doesn’t apply pressure on the spine. Choose the relative thickness of the futon sofa bed you buy such that your spine is properly supported whether you sit or lie on it. Folding mechanism: The durability of a futon depends on its weakest link, the folding frame. The continuous movement is bound to stress the joints. We checked that the most durable sofa beds have a robust mechanism in place with smooth movement so that none of the parts are wearing each other out. Cover: The material which drapes the mattress is very important. If it’s some thin material, it might rip when you flail around in your sleep. Usually upholstered futons with tufted design retain their original finish. We chose linen and faux leather futons that can withstand the continuous strain. Filling: Another factor that affects the durability of futons is the filling in the mattress. Cheap futon often compress and become hard or lumpy. The most durable futon sofa beds have the tufted design that holds their filling in place. The quality of the filling also matters. Comfort: We checked that these futon sofa beds are comfortable in both sofa and bed positions. We felt how the bed treated our back when we slept on our back. For the sofa part, we ensured that the backrest provided proper support while sitting as futons are usually used more for lounging than sleeping. Looks: Looks do matter when you buy a major piece of furniture. Wood frame? Leather upholstery? Sleek metal frame? We have covered all types of futons here. Budget: We selected the most durable sofa beds across a wide price range. Whatever amount you are ready to shell out, you deserve the best for it. We picked them such that they raise the best value for money. We compared sofa beds from different price ranges based on value. The Eastridge Futon sofa bed from Nirvana Futons blows the image of inexpensive dorm futons out of the water. This is a piece of furniture you will be proud to own. From a plush bed to a classy sofa, it makes the transition seamlessly. The hardwood frame is as sturdy as a folding apparatus gets. It’s reasonably priced for the gorgeous and reliable design. The choice of colors in this set makes it a worthwhile buy. With so much clamoring in its favor, we could not help but give it the top spot on the most durable futon sofa beds list. The Nirvana Futons Eastridge futon set speaks volumes of comfort. Its plush padding elicits the aura of relaxation. It has a solid hardwood frame with its natural finish varnished for the glaze. Seeing and feeling the frame will assure you of its durability. The frame has three positions: upright, bed and reclined. Reclined position is a godsend after a tiring day. This sofa bed is available in two sizes: full-size and queen size. The full bed opens to a 96” x 54” x 23.25” body and the queen bed opens to a 101” x 60” x 23.25” structure. The full size is enough for most guest rooms. The mattress of this sofa bed is 8 inches thick. It is made of multiple layers of poly-cotton wrapped around 4 layers of foam. This is done to provide proper firmness to the bed. Even with the thick futon, the sofa is of usual height. It doesn’t feel unusually far off the ground. The seat and the back rest have a tufted design which keeps the cotton from moving around. Further, the seat covers are done in twill or microfiber based on the color you select. There are 10 colors to select from. Royal blue to ivory, you have a wide range of choices. The frame of the Eastridge futon sofa bed has broad armrests that serve as table tray with the sofa and headrest as the bed. The frame is shipped partially assembled. The dowels are already attached to the backrest. Nirvana Futons states that the hardwood is procured from sustainable plantations only to support their eco-friendly business. The mattress is made in USA and reflects the quality you desire. This futon can hold two adults of 250 pounds each without breaking a sweat. It is easy to assemble with maximum 1-2 hours. The Eastridge futon sofa bed surprised us with the accurate balance of firmness and plushness. It supports the back without wearing it out. The frame stops around 2 inches short of the top of the back rest. So even in the sofa form, you get nice bracing for your back. The whole mechanism is easy to fold. You simply need to the push/pull the seat. But if you ask for a custom mattress height, be ready to bear the weight of folding/unfolding it. The Kodiak futon lounger is a minimalist’s dream. It is elegant without any pretenses. It’s convenient and affordable enough for your dorm room but looks much classier than the usual dorm futon beds. The metal frame unfolds in a way that it doesn’t need a lot of clearance. The wide choice of colors and patterns goes with all kinds of interiors, dorms to duplex houses. The top quality materials used in its construction make it an excellent choice for the most durable futon sofa beds list. The Kodiak futon sofa bed is a suave or pretty piece of furniture depending on the color you choose. It is backed by a metal black frame. Its powdered coated design prevents rusting. The seat/futon is supported on wooden slats that fix on the metal frame. The armrests rise at a slanting angle on both sides. The backrest stands around 26” tall in the back. The seat of the frame rises 15” from the floor. Add 5-6” of the mattress to get your sitting height. The armrests of the sofa bed are spread to convert it into a bed. The dimensions of unfolded bed are 32” in width and 79 inches in length. It’s enough for one person to sleep comfortably. This futon is made of 80% blended cotton and 20% polyurethane foam. It takes some time for the mattress to decompress after you first open it. It is coated in suede fabric. You can use the pillows from the backrest to rest your head. The suede cover cannot be removed. It is tufted down to the futon. This futon is available in 26 choices of colors/patterns. You can treat any speck of dirt to a spot cleaning, should the need arise. The Kodiak futon sofa bed is space smart in that keeping the backrest upright consumes very less space when you want to straighten the bed. It can easily put together within a couple of hours. The customer service from Kodiak also has been repeatedly praised for being quick and responsive. In some pieces, there might be a chemical odor which airs itself out after some time in the open. The Kodiak futon is surprisingly ergonomic for the price. The mattress is firm but only conservatively so. It is not plush like the Eastridge futon which stands 8” but it’s by no means uncomfortable. The suede material is soft on the skin and doesn’t attract much dirt. It can also be used as a recliner if you rest your back on the armrest. We are nitpicking, but the only issue we face is when the backrest pillows slip downwards a little. But we are glad they aren’t fixed. Otherwise, we would have to buy an extra pillow for when we open it up as the bed. If you need something that looks much more stylish than it costs, DHP Aria futon sofa bed is your answer. This elegant set shirks off the armrests and creates an easily unfolding design. It does not need much space to open. Assembly is done in the blink of an eye. It defies the quality we expect from its price. Its pristine white surface is easy to clean after the guest leaves. What more can you ask of one of the most durable futon sofa beds? The DHP Aria futon sofa bed fits beautifully with any kind of interior. If you have a small apartment, it is all the more attractive. It has a hard wood frame covering the underside of the seat and the backrest. It comes fully assembled. You only need to fit in the legs of the sofa. They may look wooden but they are likely plastic. Once open the bed is 69” long, 38” wide and 14.5” high. While sitting, it is 32 inches wide. It can bear weights of up to 600 pounds. 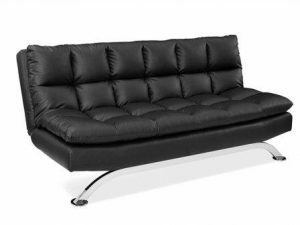 This futon sofa bed uses faux leather upholstery. The biggest advantage of this design choice is that it’s easy to clean. You can spot clean whenever you see a fleck of dirt. It has a tufted pattern which keeps the surface taut and probably prevents the filling from moving around. We do worry about the faux leather ripping off easily. But we haven’t had any instance of the yet. We loved that we didn’t have to make a lot of space every time we opened it up. It took only a few more inches at the back to unfold it. We would suggest using it as a guest bed or in someplace where is more likely to be used as a sofa than a bed. The DHP Aria futon is a firm structure. It might not appeal to those who are used to fluffy soft beds. If you prefer more softness but really like this futon bed, look for a foam cover. Aria’s price does leave the budget for something extra like that. This is by far the easiest sofa bed to fold and unfold. You only need to pull it by a few inches. For sitting and watching TV, it has the appropriate amount of pressure. We liked that the faux leather didn’t look cheap and shiny. It has a dull glow and a taut texture that perfect went with our décor. The Jerry Sales Eldardo futon sofa bed speaks volumes of durability. Its basic elegant architecture fits in with every type of setting, dorm to a fancy apartment. The thick futon makes a nice place to sleep complete with headrails. Minor assembly aside, the solid frame and comfortable mattress are ready for your onslaught of folding/unfolding. It is made by the finest craftsmen in USA. 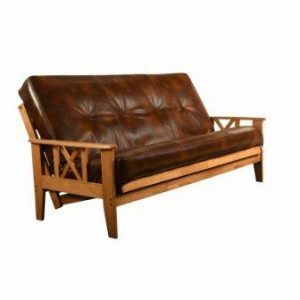 This is undoubtedly one of the best finds for the most durable futon sofa beds list. The Jerry Sales Eldorado futon sofa bed looks bold with its X-shaped hardwood frame. The backrest slants a little and opens up for the bed easily. The unfolded futon is 79 inches in length, 54.4 inches in width and 22 inches in height. When the sofa is up, its backrest comes up 37 inches high. Some of its colors are also available with a more versatile frame. These have 2 drawers underneath, one where you could keep your shoes and other to store sheets and bedding. This is in the pricier range of futons just like the Eastridge. But you pay for quality here as well. This futon is 8 inches thick. 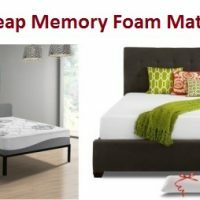 It’s a tufted coil mattress is upholstered in either fabric or leather based on the colors you select. Tufting makes for a great design and also holds the filling in place. There are 26 options to choose from including the with-drawers and simple frame models. It’s easy to put together even if it takes a little time. The mattress is vacuum packed so it won’t feel too fluffy right out of the box. Once it decompresses, it will jump right back into shape. If you intend to do a lot of sleeping on the futon, The Eldorado futon sofa bed is a great choice. It is comfortable and we have heard no complaints about it being too hard to sleep on. Unfolding is a one-person job. The texture of the fabric upholstery is soft and easy to lie on. The sofa doesn’t sag with continuous use. It’s quite durable in that it retains its original comfortable form for a long time. Here you get what you are paying for in a good way. The mattress is stuck tight on the frame. It doesn’t squirm under you. The assembly instructions are quite easy to follow and actually help with speedy assembly. If you want to add more versatility to your already talented sofa bed design, turn to the DHP Emily. This is a split- back sofa bed which allows you the luxury of sitting and sleeping without unfolding, just in case. As it usually goes with DHP, the design is too handsome for the price. It is a sturdy sofa bed when used with at least some caution. DHP suggests their chaise lounger to complete your décor for one room. The whole arrangement earns its place in the most durable futon sofa beds list. The DHP Emily Futon sofa bed is a unique design propped on a metal frame. You can see shiny chrome legs supporting the rather minimalistically cool futon. The metal frame is split into two parts at the backrest. So you can keep one-half of the backrest up while you unfold the second half into a tiny bed. It helps if your child wants to lie down or you need more space to spread out your work. When fully extended, it is 70 inches long and the seat stands around 15” tall. This futon is upholstered in linen or faux leather depending on the color you choose. Navy and grey colors are available in linen and white, black and vanilla in faux leather. Faux leather futons are easy to spot clean. Both materials have a tufted design. Inside, the futon uses a foam and polyester filling which takes the edge off it firmness. 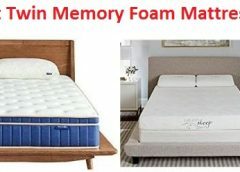 Still, you can supplement it with a foam cover for those who prefer softer beds. The sofa goes into normal upright and reclining modes. The tufted upholstery of the Emily futon is stretched well. The faux leather doesn’t look like the thin wispy pleather we usually see. The sofa bed looks much more expensive than its price. It is good for both home and office interiors. Assembly is very easy. You will clock less than an hour to put it together. Sleeping preferences vary widely. But most people agree than DHP Emily Futon is not too firm for sleeping. So it is equally useful as a sofa and a bed. The foam seems resilient as of now. The split design does offer a lot more avenues of utilizing this futon. Most people end up buying the chaise lounger for a complete arrangement. The set is perfectly designed to fully equip your room. Folding and unfolding weren’t much of a hassle. One person can easily do it. The Pearington Pillow Top Bella futon sofa bed is an exercise in comfortable design. Not only does it unfold as a bed, it has added a foam layer that makes both sitting and lying on it a plush affair. The futon is propped on a metal frame contrasting its colors. The design is tastefully contemporary. It still lies in the affordable range after all these features. It checks all the right boxes to be on the most durable futon sofa beds list. The Pearington Pillow Top Bella futon sofa bed is erected on a stainless steel frame. You only see two savory metal feet in the front. It is slightly more space consuming than the usual sofa beds. It has a base standing on the four legs. When folded into upright sofa, the base still juts out behind the back by a few inches. So in the folded position, it consumes a little more space at the back. People as tall as 6’2” will fit okay on the futon. But any more than that, their feet will hang off the bed. This futon has a thick pad topped by a foam layer. The pillow top is a soft tufted layer. Overall this keeps the back in good humor while also being sufficiently firm for straight spine alignment. The material it drapes around it is bonded leather. This doesn’t heat up like leather. Neither does it crack like faux leather. It is available in 3 colors: black, brown and grey. The Pearington Pillow Top Bella futon sofa bed is built around the comfort of long hours of sitting and lying. The pillow top is a great piece of innovation. It keeps the body from feeling stiff after a good night’s sleep. It is therapy for the back while sitting as well. The unfolding and folding procedure is quite easy because of the base we walked about earlier. This futon is a great option for anyone who would use it equally often for sleeping and lying on it. The DHP Allegra Pillow-top futon sofa bed combines DHP’s hassle-free designs with the comfort of a pillow top. This way you can add restful sleep for days together to the spec of DHP futons. It has the same sleek look as the other two DHP products covered here. The assembly time is still less than 20 mins. It is highly affordable for the gorgeous frame and the design. There is one too many highlight features here that launch it straight to the most durable futon sofa beds list. The DHP Allegra Pillow-top futon sofa bed looks just as minimalistic as the Aria. But it’s a little more majestic because of the pillow top. The frame is sturdy wood. The feet of the bed are plastic though. They whole thing is reliable and up for handling an adult or two kids. There are no armrests. This sofa bed with 600-pound weight limit measures 71 inches in length and 43 inches in width as a bed. It stands 16 inches high. 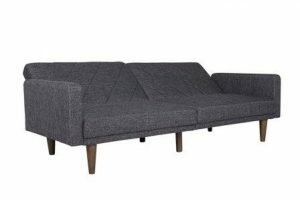 As a sofa, it’s 34.5” high and the back stands 31 inches tall. The measurements are proportionate and don’t make you feel like you are sitting on a hill. This sofa bed has a firm base topped with a pillow layer. This top layer is made of foam and adds softness to the feeling. It is draped in microfiber which is pleasant to the skin. The pillow top cannot be removed. The whole futon is done in a classy coal black color. The DHP Allegra futon sofa bed is easy to unfold just like its brothers. The pillow top sets it up for being used equally often for sleeping and for lounging. It has three positions: sofa, bed and reclining. All of them are comfy thanks to the plush finish. The base of the bed is still firm, so your spine gets the support it requires. The Divano Roma Splitback futon sofa bed defines value for money. Very affordably-priced this futon stacks its spec with versatile features. It’s a self-sufficient set complete with pillows for resting your back and sleeping. It’s the perfect fit for dorms or guest rooms. Its structure motivates confidence in its reliability, hence its place in the most durable futon sofa beds. Divano Roma Splitback futon sofa bed is a simple yet elegant set. The frame is done in metal and reflects the durability. The back rest if split into two mechanisms, one for each half. So you can have part of the sofa up while the rest is unfolded. This allows you to spread out your work or have your kids sleep next to you while you work. When it’s unfolded it measures 70” x 40” and stands 18 inches high. This is slightly higher than the usual sofas but the right height for a bed. This sofa bed has a balanced tufted futon. It is stocked with hypoallergenic filling and draped in linen upholstery. It comes with two square pillows as well. It is available in 6 colors from poppy orange to cool light grey. The tufted design holds the fabric tight in position. It’s easy to carry up for a single person. The assembly averages 30 mins to 1 hour. The Divano Roma Splitback futon is firmer than your plush beds but not so firm that it hurts the back. Sliding it away from the wall to unfold is an easy process. The sofa has armrests which serve as head and tailboards. We often used it in the reclining position because of the sofa height. Unfolding the bed is a simple process. The DHP Paxson Convertible Futon Couch Bed plays with the retro modern look for its design. The bold shape done in unassuming colors complement the creative interiors of newer houses. The split back design adds convenience to the mix. In addition to the tradition DHP sleekness, it has armrests for folks who intend to use it a lot for TV viewing. For a person going solo, it’s one of the most durable futon sofa beds available. All the visible parts of the frame of DHP Paxson futon sofa bed are done in solid wood. Since DHP usually prefers metals or other materials, this is a nice detour from tradition. It gives the sofa a retro look. The set is complete with armrests so you can sit comfortably while watching TV. The seat stands 15.5 inches from the floor. The back of the sofa is 32 inches tall. The bed is 78.5 inches long, 44 inches wide and 23 inches high at the headrail. 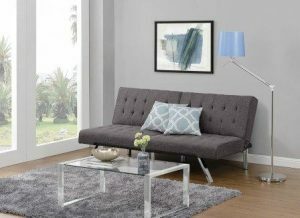 This futon has plush padding with grey or black linen upholstery. A diagonal stitching pattern decorates the backrest and the seat. The split-back design allows you to keep one part of the backrest upright and the other unfolded. The maximum weight the futon can bear is marked as 600 pounds. It can be assembled in a matter of 15-20 minutes. We discovered that the DHP Paxson futon sofa bed has three positions: recliner, sofa and bed. Each position is comfortable for regular use. It is firmer than your fluffy front-room sofa. But some people prefer the firm feel that this futon provides. It’s also good to sleep on as it keeps the spine straight. But you wouldn’t want to sit in the area where the two halves of the futon meet. As with all other DHP sofa beds, this isn’t hard to unfold. If you find it too firm, you can lay a layer of foam over it for sleeping. The DHP Premium Futon sofa bed is the epitome of contemporary furniture. The suave faux leather design is minimalistic but classy to the core. And they pack it in a very affordable price. Dorm to guest room, it will add charm to any living space. 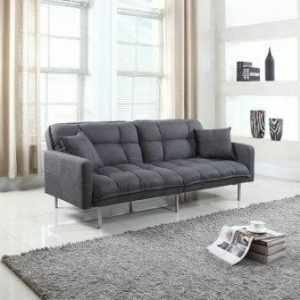 The ease of assembly and use directly earns it a place in the most durable futon sofa beds list. The DHP Premium Futon sofa bed is propped on metal legs. The assembly mostly involves just screwing the legs on. They even provide you the wrenches with which you can tighten the screws. The whole deal is set up and ready to rock within 15 minutes, 30 if you are slow. The futon is 69 inches in length and the seat stands 16 inches high. The front legs are slanted and give the sofa a carefully casual look. The futon is 6.5” thick. It is covered in faux leather upholstery. This kind of faux leather doesn’t crack with decent use. It is taut and thick in texture. 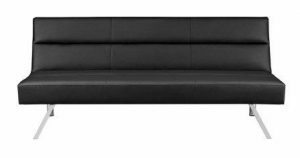 This sofa bed is available in black color. The maximum weight it can take without damage is 600 pounds. For a single person trying to optimize their living space or for a gaming den, the DHP Premium futon sofa bed is an excellent choice. It is firm but not uncomfortably so. It is softer than DHP Emily and Paxson to lie on. It is affordable but much classier than a dorm room purchase. It unfolds readily by just pulling up the seat.